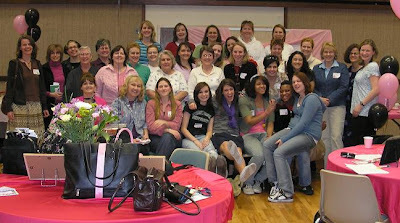 Our Relief Society Enrichment Meeting was so much fun last week! Our outgoing RS President talked to us about the purpose of Relief Society as outlined in Sister Beck's talk from the last conference and also talked about making R.S. "purse-onal" a la a purse-themed evening. Some of the sisters put together wonderful table displays illustrating these points. Others sang and bore testimony. We played games (including a purse scavenger hunt) and just had a wonderful time together as sisters. 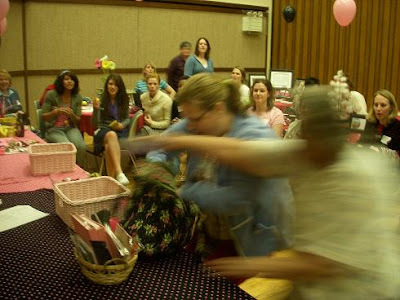 I am feeling warm-fuzzy feelings for my fellow Seeeesters in the Relief Society after this fun gathering! Here are some pictures...and a link to the website where we found the idea for our purse-themed Enrichment, which we updated and adapted for our ward. The Relief Society is a blessing in my life, and I am so thankful for this special sisterhood of which I am a part. How clever Jos. I love when RS is inventive in creating new fun things for us sisters to enjoy. What a nice evening.